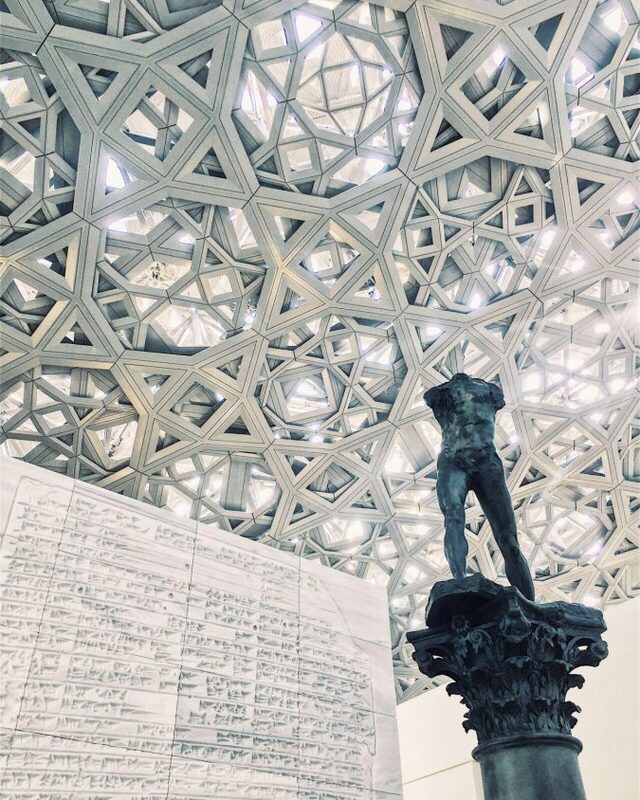 A view of Jean Nouvel’s intricately designed central dome at the recently opened Louvre Abu Dhabi. “Walking Man, on a Column,” by Auguste Rodin stands beside a commissioned sculpture by contemporary artist Jenny Holzer, which features historically important texts carved on a marble relief. Photograph courtesy of Hamza Khan. How much of an impact will the new museum have on the evolution of the region’s art market? The long-awaited Louvre Abu Dhabi opened on 11 November 2017, with its futuristic grey dome welcoming 5,000 visitors to its sold-out inauguration. Jean Nouvel’s innovative architectural design is built on the tourism-cultural project of Saadiyat Island, which is expected to become Abu Dhabi’s cultural centre. The new museum has a 30-year agreement with the Louvre, in which it can lease the Louvre’s name and brand. During this time, the Abu Dhabi museum can borrow artworks from the Louvre and other prestigious state museums in France. The museum consists of 23 galleries, and approximately 600 art objects. Of these art objects, about half come from the collections of French museums, while approximately 230 come from the Louvre Abu Dhabi’s own collection. 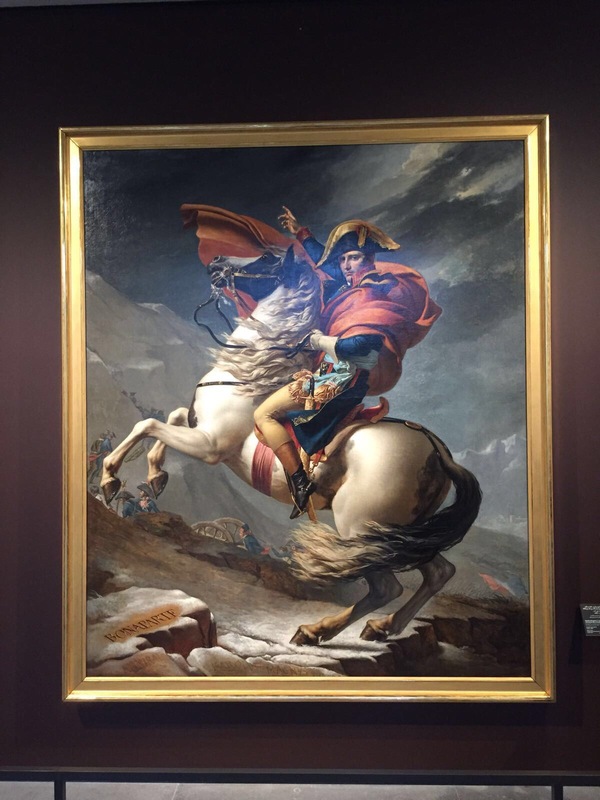 Napoleon Crossing the Alps (1801-1805) by Jacques-Louis David displayed in the new Louvre Abu Dhabi. Photo courtesy of Hamza Khan. The works on display include several masterpieces of Western art, including a self-portrait by Vincent Van Gogh, Napoleon Crossing the Alps by Jacques-Louis David, and Leonardo Da Vinci’s La Belle Ferronnière. The curation of the museum favors a more integrated display style, placing art from different periods, cultures, and religions beside one another. While proponents of this display style laud the museum for its more innovative display, some criticize the incredible amount of French art present at the opening of such an important museum in the Middle East. Why travel so far to see French art? The museum’s partnership with the Louvre, however, has many long-term benefits. For the steep price of $1.5 billion, the Louvre Abu Dhabi benefits from the Louvre’s reputation in order to attract new visitors and increase tourism for arts related activities in the region. The contract is extremely beneficial in that it gives the Louvre Abu Dhabi something that it is missing: time. A quality museum collection can take decades to compile, and this collaboration allows the Louvre Abu Dhabi to fill their museum with masterpieces while they continue to develop their own collection. It is entirely possible that in 30 years the museum will no longer be associated with the Louvre. By that point, however, it will not be important. The brand will be in place, and it will only take a generation to forget how much money the museum paid for their reputation. Wall text design at Louvre Abu Dhabi. Photo courtesy of Hamza Khan. The strategy employed by the Louvre Abu Dhabi seems unprecedented. Traditionally, museums are created to house and display already formed collections. Over time, as a museum’s collection grows, it expands. Conversely, the Louvre Abu Dhabi has built a gargantuan architectural marvel for a collection that has been, and will continue to be, amassed in a very short amount of time. The parallels reach even deeper, spreading to historical issues such as colonialism and repatriation. While large Western museums, such as the British museum, have spent centuries gathering objects, often controversially, from different countries and colonies across the globe, the Louvre Abu Dhabi is doing the opposite by importing Western works of art to display. The way in which the Louvre Abu Dhabi is disrupting the conventional museum model is fascinating. The UAE seems to be adapting traditional models to fit its own unique identity and trajectory as a country. The UAE is much younger, and much wealthier, than most other nations. As a result, the UAE is in the midst of an intense period of assembling the foundation of its cultural infrastructure. There are plans to construct two more museums, the Guggenheim Abu Dhabi and Zayed National Museum, in the Saadiyat Cultural District. The country’s relative youth, and its lack of an established infrastructure in the arts, have caused many institutions to import foreign talent to fill a deficit in skilled cultural professionals. Creating a balance between relying on international expertise and cultivating one’s own cultural heritage and identity is an issue at the forefront of this new era of “culture building” in the Middle East. This conversation between Western internationalism and the promotion and support of local culture is exemplified perfectly in the presentation and reception of the new Louvre Abu Dhabi. The issues facing the development of the UAE’s institutional infrastructure also have a large effect on the regional contemporary art market. The Middle Eastern art market has expanded immensely in the past decade, and has generated a new generation of dealers, galleries, and auction houses in the region. It status as an emerging market means that collectors and dealers are more likely to see larger returns on their works compared to other more established sectors, but with a higher degree of risk. ArtTactic’s own Middle East art market researcher, Sarah Hameed, describes how important the market is internationally, because it “serves as a platform for not only the Middle East, but also South Asia, North Africa and their patrons. It operates as an outlet for artists who may have restrictions on reaching a larger platform depending on where they are based. Artists who are given the opportunity to showcase their work at Art Dubai, Art Abu Dhabi, and Art Beirut can instantaneously gain access to a significant platform that reaches an international collector base.” The cultural and institutional development in the UAE will contribute to the stability of the market, and to the support of artists from surrounding countries and regions. 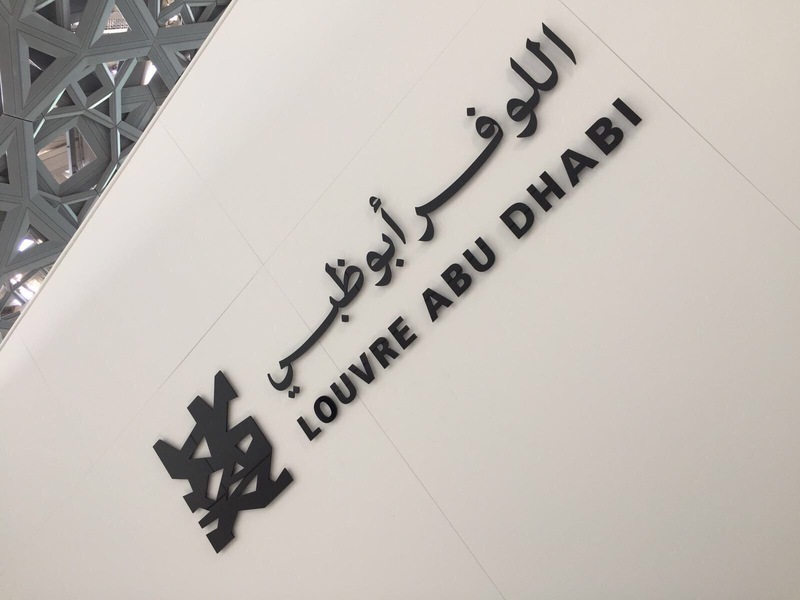 While the opening of the Louvre Abu Dhabi is an exciting new development in the cultural history of the region, it seems that new institutions may not have an immediate impact on the market. While buildings can be erected fairly quickly, prevailing attitudes toward the value of art, especially contemporary art, may not be as quick to change. While building institutions is important, creating an art ecosystem to support the art market is crucial. Emirati entrepreneur and Art Dubai team member, Noura Al Dhaheri, describes the difficulties that younger generations in the UAE face: “Due to a pre-existing cultural barrier, many Emiratis from my generation still have difficulty convincing relatives of older generations that the arts as a career is beneficial, to the country, to society, and to themselves…Older generations do not consider the arts relevant, regardless of the museums opening. This is a cultural way of thinking, and there is still so much work to be done to educate the population on the importance of art education and its benefits to the younger generation, and to the art market”. Educating and training a new generation of arts professionals in the Middle East is a crucial step to improving the longevity of its art market. Additionally, teaching a general appreciation for contemporary art will create a community of support for contemporary arts creation. For a more in-depth analysis of the Middle Eastern Art Market, read ArtTactic’s Middle East and North Africa Art Market Report, written by specialist Sarah Hameed.